Mission of our company - to give the chance to any person to have a color printer, all-in-one or fax at home or at work, to use it to its full capacity, without paying attention to the cost of original consumables. We confidently declare that using Continuous Ink Supply System (CISS) print cost decreases by tens or even hundreds of times, at constant high quality and convenience of work. 1. Achievement of the same or better result of print in comparison to original consumables. 2. Maintenance of the complete list of materials for inkjet printing: CISS / refillable cartridges, various kinds of ink and paper. 3. High quality of consumables in relation to similar products of other companies. 4. Active development of a dealer network worldwide for granting to people from different countries a chance for inexpensive and qualitative entrepreneurship. 5. Observance of corporate standards of the company worldwide. 6. 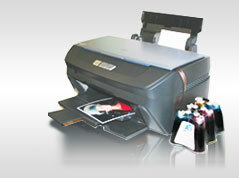 Guarantee and post warranty technical support for INKSYSTEM products. INKSYSTEM CISS are designed as much as possible to be simple and convenient for installation. Usually installation process takes from 10 to 20 minutes, further the user only adds ink of required colors. For offered models of CISS and cartridges, instructions on installation with photos and a detailed description are provided. For the most popular models video-instructions on installation are provided. Each user of INKSYSTEM products has a right to free installation of CISS or cartridges on their own printing system. All you have to do, is bring your printer or plotter to the nearest representative office of our company and in the shortest time frame we will organise reliable and qualitative installation, and we will also test print quality. The company supports guarantee certificates for its products according to the legistlative regulations of the country where sale of the given goods has been made. Warranty period extends according to guarantee certificates which are indicated in "warranty" section. We care about the reputation of our company and we show consideration for each buyer, regardless of the purchased amount. INKSYSTEM today is the unique company which can offer CISS for 97 % of printers, all-in-one devices and plotters which have been made over the last 10 years. We undertake delivery of the most difficult and rare items. Send the inquiry, and we will do everything to execute your commission. For those who wish to purchase the jet printer, but do not wish to overpay for expensive cartridges, "the complete solution" - the printer + filled CISS is offered. Promotion discount constantly operates on our web-site, having taken which, you can acquire the printer at wholesale price, and also receive free installation of the system. It will relieve you from additional material input and time expenses.